In Spanish, “vida” means life. Vital Intervention and Directional Alternatives (VIDA) is committed to giving kids the knowledge and skills needed to transform their lives for the better. Parents can also benefit from VIDA through weekly sessions designed to foster understanding and improve communication between family members. 2. Who is VIDA for? VIDA accepts non-violent, at-risk youth between the ages of 11 and 17½ who are struggling with parent relationships, academics, anti-social peers/attitudes and making smart decisions. Typically, participants are referred to the program through a community agency. Participants are then interviewed by trained VIDA staff members to determine if they meet the program’s targeted risk level. Parents can also enroll their children in the program. Please visit the parents’ corner page to request an appointment. 3. Does the program require a big commitment? Yes. VIDA is a structured, 16-week program that requires both participant and parent/guardian(s) to commit themselves fully in order to see results. Participants and their families are initially required to attend an orientation night and weekly sessions thereafter. Throughout the program, VIDA staff members conduct home and school visits, and participants spend eight hours on Saturdays at the VIDA sites closest to their homes. The program began as the dream of East Los Angeles Station deputy sheriffs who wanted to help troubled youths and their families. 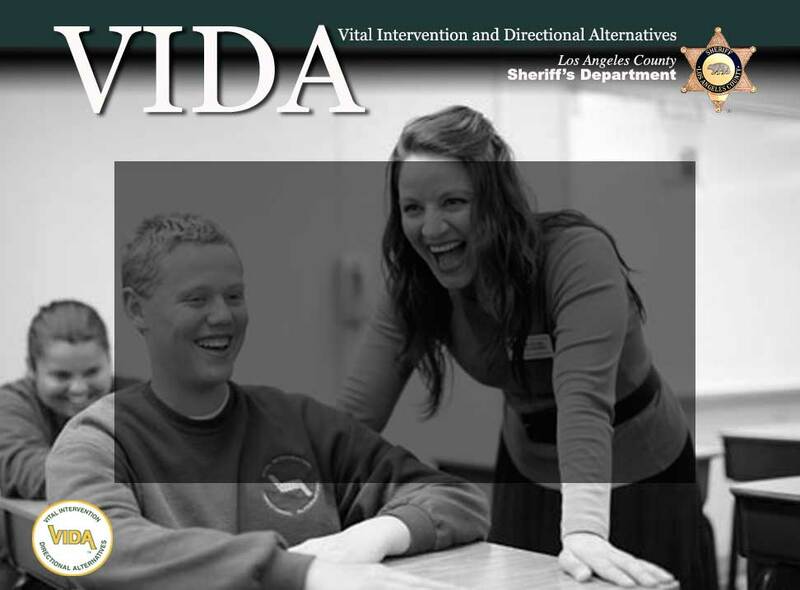 Since VIDA began in 1996 and went countywide in 2000, the Los Angeles Sheriff’s Department has retained its responsibility for continuing the program; however, VIDA is also made possible by a number of community-based organizations, volunteers, schools and families. Volunteer at your local VIDA site – please contact the VIDA staff at a site near you. 6. When does the program begin? VIDA runs concurrent the school year. We run a Spring and Fall class. Projected class schedules – subject to change without notice. All the dates are tentative and subject to change. 7. Where is VIDA located? Various, please see the locations link above. 8. How can I learn more about VIDA? We encourage you to look around the site. If you’re interested in speaking with VIDA staff directly, please request an appointment by clicking on the parents’ corner link.